Interesting article consistent with what Joel Schneider and I discussed in our latest CHC Intelligence theory update chapter. Click here for info. 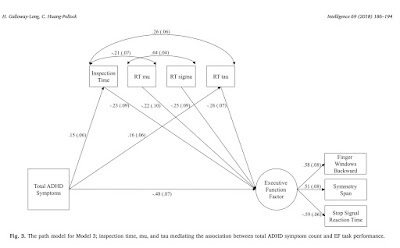 Using inspection time and ex-Gaussian parameters of reaction time to predict executive functions in children with ADHD. 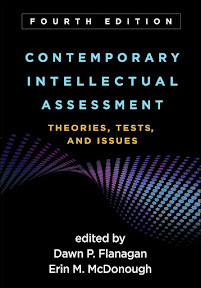 Intelligence, 69 (2018) 186–194. Slower and more variable performance in speeded reaction time tasks is a prominent cognitive signature among children with Attention Deficit Hyperactivity Disorder (ADHD), and is often also negatively associated with executive functioning ability. In the current study, we utilize a visual inspection time task and an ex-Gaussian decomposition of the reaction time data from the same task to better understand which of several cognitive subprocesses (i.e., perceptual encoding, decision-making, or fine-motor output) may be responsible for these important relationships. Consistent with previous research, children with ADHD (n = 190; 68 girls) had longer/ slower SD and tau than non-ADHD peers (n = 76; 42 girls), but there were no group differences in inspection time, mu, or sigma. 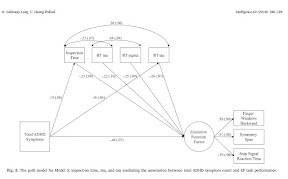 Smaller mu, greater sigma, longer tau, and slower inspection time together predicted worse performance on a latent executive function factor, but only tau partially mediated the relationship between ADHD symptomology and EF. These results suggest that the speed of information accumulation during the decision-making process may be an important mechanism that explains ADHD-related deficits in executive control. Tasks measuring Gt are not typically used in clinical settings (except perhaps in CPTs). With the increasing use of low-cost mobile computing devices (i.e., smartphones and iPads/other slate notebook computers), we predict that practical measures of Gt will soon be available for clinical use. Some potential clinical applications are already apparent. We present three examples. Gregory, Nettelbeck, and Wilson (2009) demonstrated that initial level of and rate of changes in inspection time might serve as an important biomarker of aging. Briefly, a biomarker for the aging process “is a biological parameter, like blood pressure or visual acuity that measures a basic biological process of ageing and predicts later functional capabilities more effectively than can chronological age . . . a valid biomarker should predict a range of important age-related outcomes including cognitive functioning, everyday independence and mortality, in that order of salience” (p. 999). In a small sample of elderly individuals, initial inspection time level and rate of slowing (over repeated testing) was related to cognitive functioning and everyday competence. Repeated, relatively low-cost assessment of adults' inspection times might serve a useful function in cognitive aging research and serve as a routine measure (much like blood pressure) to detect possible early signs of cognitive decline. Researchers have demonstrated how to harness the typical non-normal distributions of RT as a potential aid in diagnosis of certain clinical disorders. Most RT response distributions are not normally distributed in the classic sense. They are virtually always positively skewed, with most RTs falling at the faster end of the distribution. These distributions are called ex-Gaussian, which is a mathematical combination of Gaussian and exponential distributions. It can be characterized by the mean (m), the standard deviation (s),and an exponential function (t) that reflects the mean and standard deviation exponential component (Balota & Yap, 2011). (Don't worry; one does not need to under-stand this statistics-as-a-second-language brief description to appreciate the potential application.) The important finding is that “individuals carry with them their own characteristic RT distributions that are relatively stable over time” (p. 162). Thus, given the ease an efficiency with which RT tests could be repeatedly administered to individu-als (via smart devices and portable computers), it would be possible to readily obtain each person's RT distribution signature. Of most importance is the finding that all three RT distribution parameters are relatively stable, and t is very stable (e.g., test–retest correlations in the high .80s to low .90s). Furthermore, there is a robust relation between t and working memory performance that is consistent with the worst-performance rule (WPR) discovered in the intelligence literature. The WPR states that on repeated trial testing on cognitive tasks, the trials where a person does poorest (worst) are better predictors of intelligence than the best-performance trials (Coyle, 2003). It has been demonstrated, in keeping with the WPR, that the portion of each person's RT distribution representing the slowest RTs is strongly related to fluid intelligence and working memory. In the not-too-distant future, assessment personal armed with portable smart devices or computers could test an individual repeatedly over time with RT paradigms. Then, via magical software or app algorithms, a person's RT distribution signature could be obtained (and compared against the normative distribution) to gain insights into the person's general intelligence, Gf, or working memory over time. This could have im-portant applications in monitoring of age-related cognitive changes, responses to medication for attention-deficit/hyperactivity disorder (ADHD) or other disorders, the effectiveness of brain fitness programs, and so forth. Finally, using the same general RT paradigms and metrics, research has indicated that it may be possible to differentiate children with ADHD from typically developing children (Kofler et al., 2013) and children with ADHD from those with dyslexia (Gooch, Snowling, & Hulme, 2012), based on the RT variability—not the mean level of performance. It is also possible that RT variability might simply be a general marker for a number of underlying neurocognitive disorders. We have the technology. We have the capability to build portable, low-cost assessment technology based on Gt assessment paradigms. With more efficient and better assessments than before, build it . . . and they (assessment professionals) will come.